A boat owner in Kent has defended some up-close footage of "Dave the dolphin" which has been posted on video sharing website YouTube. The dolphin can be seen swimming around several boats and gets so close to one that an oar nearly touches him. Marine vet Iain Cope said the footage of Folkestone's coastal tourist attraction was a cause for concern. But Richard Tozer, whose rowing boat was used for the filming, said: "He was just coming close to the boat." Mr Tozer insisted he would never have done anything to harm the dolphin. He said: "We were just out having a nice day in the sunshine with my children, and seeing a dolphin there is a wonderful thing to see." But Mr Cope said: "I think unfortunately for quite a few people it is a thrill to go out there. "The main concern is that the interaction and the humanisation of Dave will eventually possibly lead to his death." 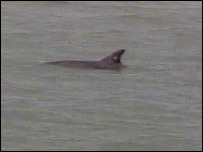 Swimmers, kayakers and other watercraft users have been told to keep their distance from the dolphin, which has been a regular sight off the Kent coast since last April. The Kent Police Marine Unit has said anyone getting too close to Dave could be at risk of prosecution.